It's surprising to note that the world's bestselling author, Agatha Christie, has relatively few film adaptations to her name. One of the Queen of Crime's most enduringly popular novels, Murder on the Orient Express, bucks the trend somewhat: having already been adapted to all-star, silver screen effect by Sidney Lumet back in 1974, the story returns in 2017 under the auspices of director/star Kenneth Branagh. The premise, as before, is both deviously simple yet fiendishly complex: a snowbound luxury train, a dead body and a dozen suspects, all of whom with skeletons in their closet. It falls to legendary detective Hercule Poirot, a passenger on the Orient Express at the time, to solve the mystery. At the same time Branagh adds some directorial flourishes of his own, not just in the Jerusalem-set prologue but also with his energetic take on the iconic Poirot himself. Add to this the luxuriant production design and ridiculously starry cast, among them Judi Dench, Michelle Pfeiffer, Daisy Ridley and Johnny Depp, and it's little wonder the movie steamed to UK box office success back in November. 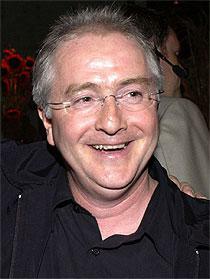 The movie also allows for the continuation of the enduring partnership between Branagh and composer Patrick Doyle, one of the most fruitful and diverse in contemporary cinema. Their collaboration dates right the way back to 1989's toiling, powerful Henry V and has encompassed such high points as the majesterial Hamlet in 1996 and, more recently, the magical Cinderella. Branagh is a director who favours musical dialogue in his movies, prioritising Doyle's famously lyrical, melodically lush side in the majority of their movies together, whether it's the 1994 Gothic horror Frankenstein or 2011 Marvel blockbuster Thor. Pleasingly, Murder on the Orient Express does little to buck the trend, picking up where Richard Rodney Bennett left off. Fluttering duduk, lively percussion and specialty instrumentation kick things off with a distinctly Middle Eastern flavour in the opening 'Wailing Wall' before Doyle's familiar warm, all-encompassing strings take over in the ensuing 'Jaffa to Stamboul', an expansive piece full of beauty. The piece is reprised later in wonderful, anticipatory tones in 'Departure', underscoring the Orient Express's departure from Istanbul: the full scope of the symphony orchestra opens up just as the story's environment does, although given the trajectory of the narrative there isn't much room for it to appear again. 'Arrival' plays around with more Middle Eastern tones before the dancing strings and bubbly piano at the start of 'Orient Express' usher in Poirot's theme: refined yet playful, mischievous yet keenly aware, the music encapsulates the contradictions inherent in Branagh's portrayal. The score then takes a far more somber, introspective tack with the introduction of the third principal theme, that depicting the murder and its ensuing emotional cost. Cimbalom, melancholy piano and stark strings weave their way through 'Judgement' whereas 'Touch Nothing Else' is even darker, Doyle intentionally draining the melodic colour from the score to reflect both the shockingly violent circumstances and the snow-blanketed whiteness in which the Orient Express finds itself. At the same time the composer intelligently weaves the primary themes around one another: 'Macqueen' translates Poirot's theme into a deceptively graceful piano solo, the classy veneer underscored with a sense of pensive, intellectual rigour befitting the world's greatest detective. Another interesting move is to translate the unique, reedy tone of the duduk into the paranoid environment of the train itself: by using regional instrumental colours that subtly jar with the genteel atmosphere of the Orient Express interior, Doyle sends out a clever signal to the listener that all is not as it seems. Poirot's theme takes on a slightly more purposeful air with insistent harp ostinato and triangle in 'Mrs. Hubbard' before 'This Is True' and 'Twelve Stab Wounds' change up the tone again, the ever-present duduk mixing with a churning bass string undercurrent and cimabolm to give a genuine sense of mystery and malevolent intent. 'The Armstrong Case' then introduces the score's fourth, standout theme, a tragedy-laden melody teasing at the potential motivations behind the murder: steady solo piano (performed by Doyle himself) and a heart-rending violin solo call to mind any number of classic Doyle scores like Hamlet or A Little Princess. Lest we forget, Doyle is also a fine action composer when the situation calls for it, and Orient Express allows for two such occasions. In both 'Keep Everyone Inside' and 'Dr. Arbuthnot' the orchestra erupts with racing strings, violent brass and shattering timpani befitting Branagh's more action-packed, uncompromising take on Christie's classic detective. Generally however, the mid-section of the score remains understated, 'Confession' ushering the mystery theme into surprisingly emotional areas with wavering strings and piano while 'Geography' features another piano solo of captivating intricacy. 'One Sharp Knife' brings back Poirot's theme, violins and violas merging with the duduk, plus staccato celli and double bass, to give a sense of slow-burning realisation, as does 'Ma Katherine' with its subtle choral undercurrent. All-the-while throughout the final third of the score we get a sense of the build towards Christie's gloriously clever reveal, the orchestra never quite reaching full catharsis in 'True Identity'. The brass-led variant on the Armstrong theme in 'It Is Time' then leads to the score's highpoint, 'Justice', a nine-minute tour-de-force variant on said theme that elevates the entire score to unprecedented, moving heights. Doyle's earlier sense of reserve is now allowed to take a back seat at his exquisite musical theatrics lead us through the deeply poignant end game, graceful piano and strings transforming the narrative from sly murder mystery into a far more troubling examination of moral ethics and personal tragedy. It's one of the standout cues of 2017, and one of the highlights of Doyle's entire career. 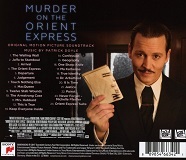 We then cap off with a jazz piano variant on the detective theme in 'Poirot' before a Doyle/Branagh-penned, Michelle Pfeiffer-performed song, 'Never Forget', leads into the summary of the score's primary themes in 'Orient Express Suite'. It's the culmination of another fine score from Doyle, one that perhaps avoids ranking with his very best due to its largely unobtrusive nature. Of course, when dealing with a dialogue-driven Agatha Christie adaptation, in which the clues and nuances of speech are of paramount importance, it's vital for the music to take something of a back seat, lest it get in the way. For that reason it doesn't attain the heights of his previous collaborations with Kenneth Branagh but it nevertheless earmarks Doyle as one of cinema's finest dramatatists, and is worth it for that sublime 'Justice' cue alone. That piece, in all its protracted, heart-rending majesty, secures Doyle as an underrated modern master of film music. 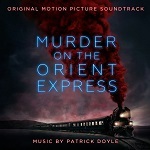 Patrick Doyle's Murder on the Orient Express is available at Amazon.co.uk and Amazon.com, in both CD and MP3 download formats.